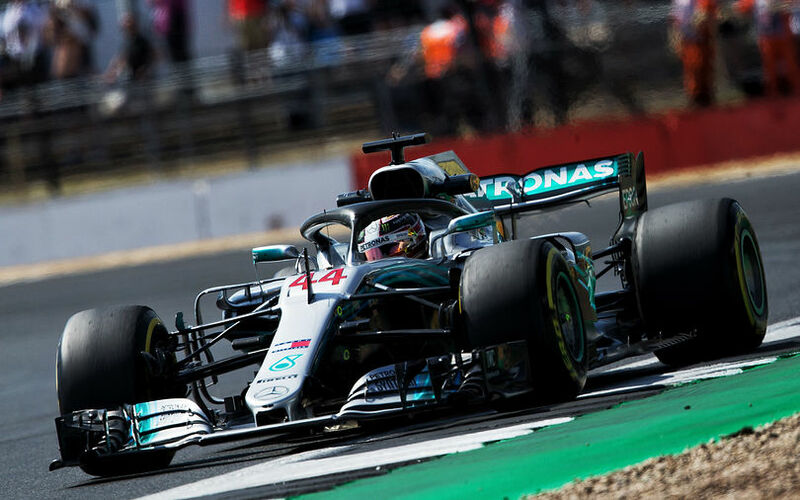 Lewis Hamilton topped the first free practice session at Silverstone as the Brit seeks to score his third consecutive win at his home Grand Prix this year. Valtteri Bottas was second fastest for Mercedes, leaving Vettel behind in third. The session was completely trouble free for both Mercedes drivers as they further evaluated their upgrades that were introduced at the Austrian Grand Prix. Ferrari trialled a few new developments while both drivers at Red Bull Racing tested a new front wing. Verstappen however ended up stopping on the start finish straight with a gearbox issue close to the end of the session. There were also driver errors, with Ferrari's Kimi Raikkonen spun his car off at one point, but he came away unscathed. The situation was different for Romain Grosjean. The Frenchman lost control of the rear end of his of his VF-18 and ending up in the barriers, after his DRS appeared to accidentally stay open. The Frenchman still ended up in 7th even though he completed only 12 laps. The team later also announced that repairs would mean that Grosjean was set to miss FP2. The other Haas of Kevin Magnussen was involved in a squabble with McLaren's Fernando Alonso. Both men went side by side through Turns 1, with Magnussen later crossing into the path of Alonso on the Wellington straight. Both drivers were summoned to see the stewards, but it was decided no further action was required.